Worse, they’re marching on Hagudst. And most of my army is still trekking back from the north. As a stalling measure, I cast the freeze spell on them. Can I train enough spiders before Yithril attacks? 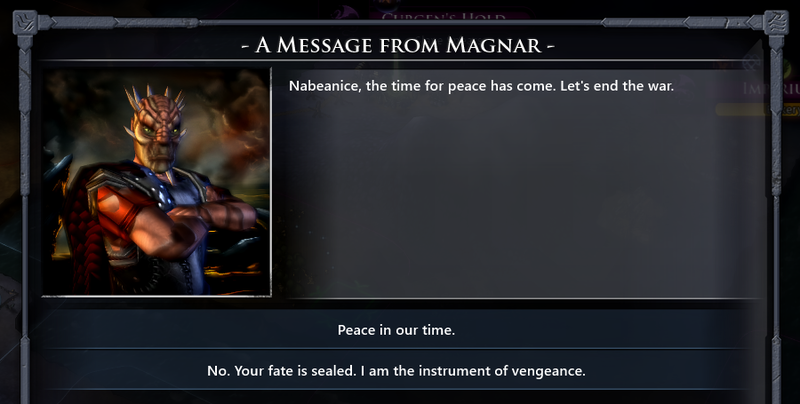 Sure, yes, lets have a peace treaty. That’s a far far better idea than you walking in and capturing my capital city. Tarth also ask for a peace treaty but I decide to refuse: they’re one of the few factions with fewer points than me, and I have an army reading to raid one of their settlements. 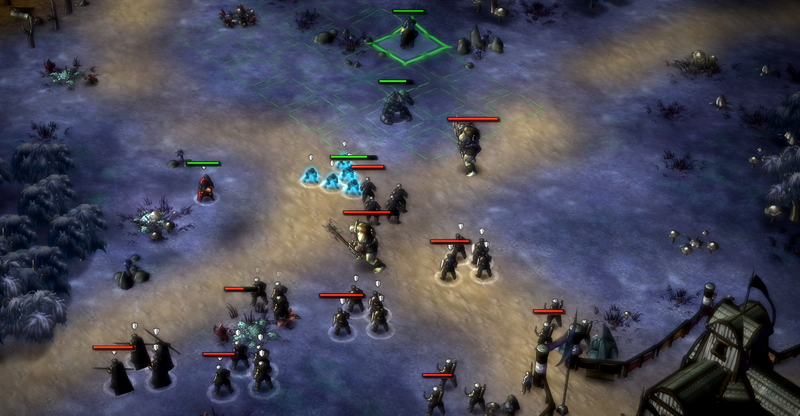 Finally, a battle with more than 3 units per side! Things are now looking a little better. The net result of all this warring is that I’ve captured one city of Magnar and one off Tarth, while only losing a couple of outposts. It could of been a lot worse. 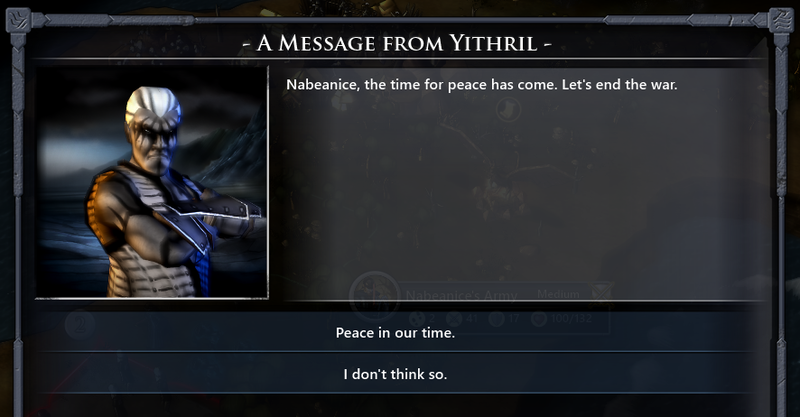 Except, except that Yithril now has three times as many points as me, and has decided to declare war again. So much for brotherly love between Empires. And this time, Warlord Vega apparently means it and swiftly defeats my feeble militia and conquers Riss. I decide that I’m not really enjoying this game any more. Perhaps its just because I’m losing. Perhaps. But I think the bug last time has something to do with it. 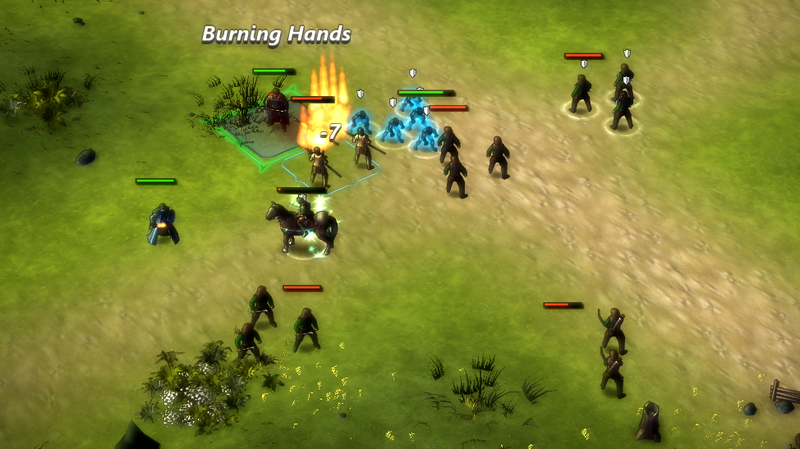 And the fact that the AI appears pretty unconvincing. Yes, it’s currently beating my just now, but I suspect that is because it has been given some solid build orders, while I’m still a long way from appreciating which buildings should be built in which order. I have a hunch that I possibly could still win this game, but it would come down to the AI playing badly (seeking peace treaties instead of trying to win, etc), which would feel like a pretty hollow victory. So, I launch a desperate counter attack. Perhaps I can martial my meagre forces in battle and prevail against a stronger foe. Perhaps. Maybe if the tactical battle system was more sophisticated. (Or maybe if I was a better player? I can’t tell if or how much skill is involved in the tac battles). 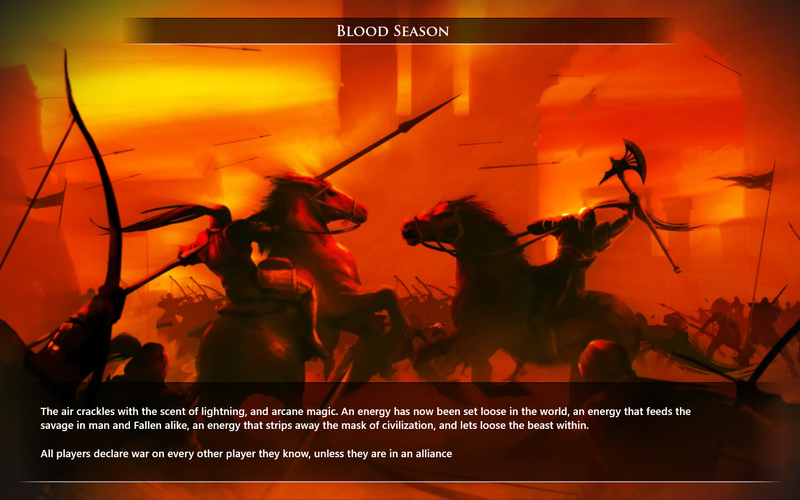 So, the end result is pretty much the same as War of Magic. Sure, Fallen Enchantress is a lot lot lot better. But, given that Stardock are working on the next version, I can’t see myself bothering to play it again. For now, the game doesn’t give enough feedback on why the AI is beating me. 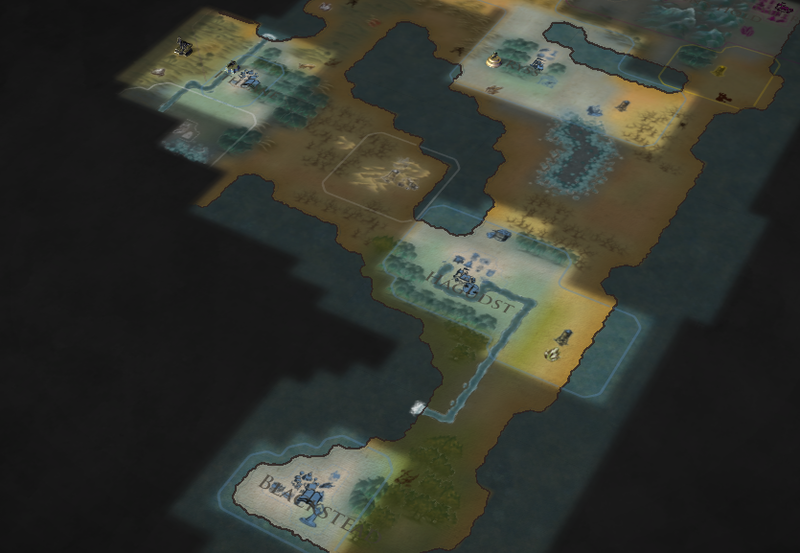 I can’t quite put my finger on why, but the Civ games do this a lot better. Maybe I’m just really familiar with the Firaxis way of thinking, I dunno. But as it stands, the game just isn’t luring me in well enough to find out more. And the tactical combat is still mindless. I’ll wait until later this year (once Legendary Heroes is out and has been bug and balanced tested bit).